I laffed my a** off when i learned about the Pop Rocks and Coke incident. I thought, "nah, ya gotta be kiddin' me." Yup, they're still around. 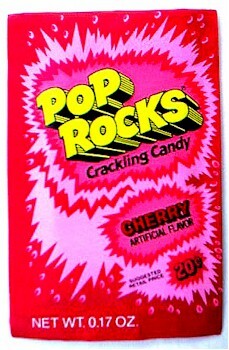 See their website, http://www.pop-rocks.com. BTW, the pilot episode of the Mythbusters TV series thoroughly debunked the myth that mixing Pop Rocks and cola could cause your stomach to explode. Talk about a "DIFFERENT" kind of hook to attract kids. I wonder if these are still made. Today, it's coke and mentos...lol.